The Denver Broncos will play week one of preseason Saturday night against the Minnesota Vikings with many headlines of attention. Former Broncos quarterback and now Vikings quarterback Trevor Siemian is back at Mile High Stadium to play against his former team. As is second-year quarterback Kyle Sloter, who will likely see action in the game as well. They’ll oppose former Vikings quarterback Case Keenum in a game of flippity-flop when it comes to quarterbacks. The Broncos will have many positions to watch that are covered in the latest edition of the Broncos Blitz podcast as host Ronnie Kohrt breaks down the key priority positions going into preseason game No. 1. It’s obviously solidified at the top. Chris Harris Jr. and Bradley Roby are the starters, but at the nickel, it’s far from solid. Rookies like Isaac Yiadom will get time, while Brendan Langley tries to prove his stock. Tramaine Brock is still up in the air to play, who has dealt with injury that’s held him out for most of training camp. The Broncos have a stable of running backs, the problem is who will rise to the top? 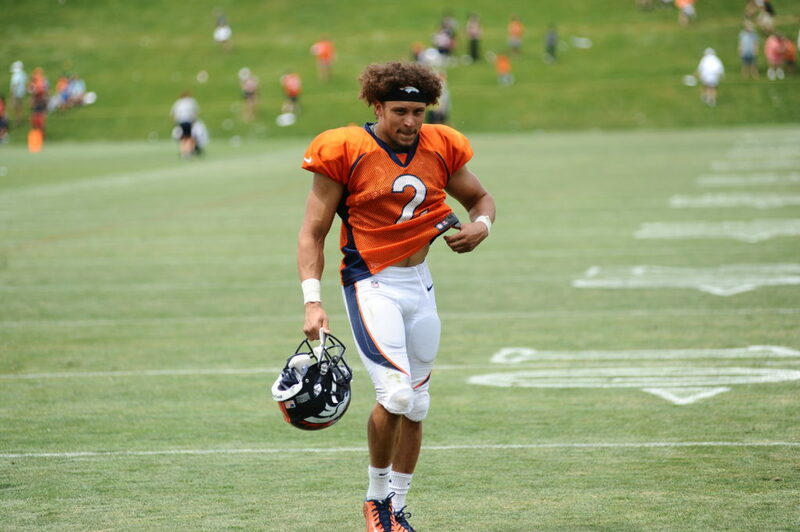 Devontae Booker starts out of the gate, but expect a dosage of De’Angelo Henderson, rookie Royce Freeman and potentially a running back destined for the practice squad in David Williams. Denver needs a lead back, that process of finding him out starts now. Preseason is not only for viewing and evaluating how players are doing, it’s also a good measuring stick to see how the coaching staff worked in the off season. With the offensive keys now handed over to Bill Musgrave, he has plenty of tools at his disposal to be effective. With a quality new quarterback pulling the trigger — Where Denver’s offense goes is up to him. Case Keenum‘s the starter, period, end of story. But who plays the important back up role is still up in the air. Paxton Lynch is set to be the back up after being named so in the first initial depth chart released by the Broncos, however Chad Kelly will push Lynch for that opportunity as preseason progresses. Slip ups by Lynch could allow Kelly more opportunities to steal the spot away. Lindsay has demonstrated in training camp he can be not only an effective player, but versatile in the offensive run and pass game — or on special teams returning kicks. Lindsay was listed as the starting kick returner when the first depth chart is released. He is a versatile back that will be need to be creatively used by the Broncos offense to be unlocked to his full potential, something that will be interesting to monitor against Minnesota. A player who is basically a rookie after a strange first year where he was moved to a different position, asked to drop weight and change his game. Now with a fresh new year, new weight and return to his previous position he dominated in college. Production from Walker would be a premium bonus that Denver would welcome with open arms. A name certainly Broncos Blitz podcast host Ronnie Kohrt will be watching.